Tongue irritation can be a quite mysterious symptom commonly experienced by women at different stages. Sometimes it results from an unfortunate bite, while other times, it can be a rare symptom of a common medical condition. It can also be of unknown cause, adding to the confusion among the doctors, as well as the sufferers. Check out the most frequently asked questions about tongue irritation to learn more about this painful symptom. What Are the Symptoms of Tongue Irritation? 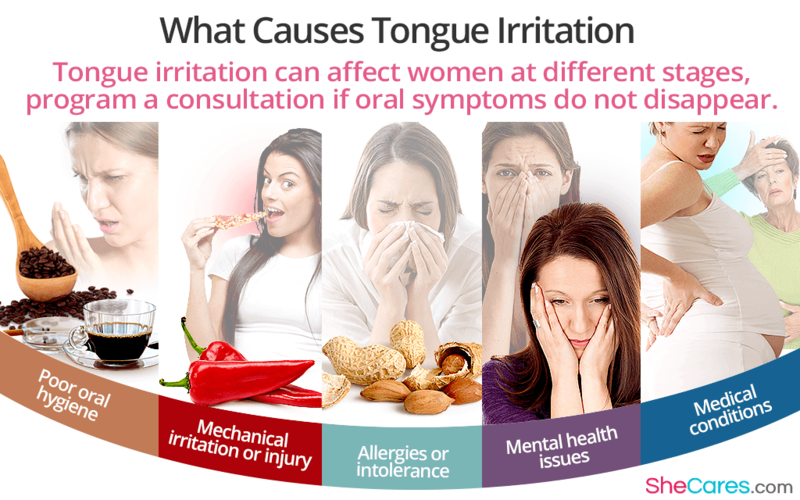 Many women experience tongue irritation without any other symptoms or detectable tongue abnormalities. Their tongue might feel painful or oversensitive, especially when they eat or drink. Some women also complain of a burning sensation that makes it difficult to talk and swallow. The majority of times, tongue irritation is short-lasting and triggered by environmental or habitual factors. However, other underlying causes might be more complex, such as hormonal abnormalities, infections, and other diseases. Many of the acute cases of tongue irritation arise from poor oral hygiene. Over brushing your teeth and tongue or using abrasive oral products, like a toothpaste or mouth wash, can also irritate the surface. Smoking and alcohol can also negatively affect you oral hygiene and cause tongue irritation. Sometimes eating something hot, acidic, or spicy or biting your tongue can cause irritation, but this sensation usually goes away relatively quickly. More serious injuries, however, might be caused by chemical burns or neuropathy, which is a nerve damage that can be permanent. Many types of food, such as peanuts, or additives used in food, like monosodium glutamate (MSG), can trigger an allergic reaction with numerous symptoms from tongue irritation to shortness of breath and palpitations. Many women are not aware that their mental health status can generate physical symptoms. Women who struggle with depression or anxiety disorder, as well as those live under high stress, often suffer from tongue irritation and burning. There are many medical conditions associated with tongue irritation. Some are related to hormonal changes during pregnancy or menopause or deficits in vitamin B, iron, or zinc, while others might include mouth ulcers, oral infections, or endocrine disorders, such as diabetes or thyroid disease. Although tongue irritation is unpleasant and might be painful, it generally does not indicate the existence of a serious disease or complications. Most doctors and dentists recommend scheduling a consultation if oral symptoms, such as tongue irritation, do not disappear within 7- 10 days or if they are recurring. If you believe that your tongue irritation is a symptom of an allergic reaction, seek an immediate medical attention to prevent anaphylaxis. Moreover, cuts and burns can become infected if they are not properly treated, so let your doctor know right away if your tongue becomes swollen, red, very painful, or if you notice puss. Can Tongue Irritation Be Cured? In many cases, tongue irritation can be cured, but it depends on the underlying cause. Stabilizing your hormones or treating vitamin deficiencies can often effectively eliminate tongue irritation. Managing other medical conditions, such as diabetes or thyroid disorders, might also reduce the occurrence of tongue irritation. In other cases, however, tongue irritation can only be alleviated with natural remedies, such as saltwater and turmeric mouth rinse, or medications. It mainly occurs if this symptom results form a permanent nerve injury or rare autoimmune disease. Tongue irritation can potentially affect your self-esteem, family and social life, as well as work and school performance, so it is imperative to let your doctor know if this symptom persists and starts to negatively affect your life. If you continue experiencing painful tongue irritation, you might want to take advantage of some natural ways to relieve tongue pain.